An exercise bike is easily the best piece of fitness equipment I can recommend for the aging population. Exercise bikes are affordable, safe to use, and easy on the joints. However, finding the best exercise bikes for seniors can be a little daunting. Don’t worry, I’m here to help. This guide will show you the two types of exercise bikes I recommend for seniors and teach you how to make the right choice. I will also provide a complete list of the best options currently available on the market. As a home health physical therapist, the majority of my patients fall into the “senior” category. I’m often asked by my patients and their caregivers what type of exercise equipment I would recommend for them to have in their home. This happened to me the other day and it got me thinking- not only middle age folks are working out in their home gyms. People of all ages can and should workout effectively from home. Our capabilities and needs may change as we age, but the fact is that exercise is good for all of us, especially as we get older. There has been a lot of research done on all the benefits of exercising as we age, including improved strength, improved mobility,and decreased fall risk. The National Institute on Aging is a great resource for seniors to learn about exercise. Most seniors are going to do best with either a recumbent bike or a pedal exerciser (pedaler). Let’s take a closer look at the differences between the two to see which type is best for you or your family. Recumbent bikes are a great choice for seniors because they are the most comfortable of the exercise bikes. They have larger back supports and larger seats, both of which increase comfort for the user. Having the pedals extended forward puts less pressure on the hips and knees- this is great for folks dealing with arthritis or achy joints. The type of low-impact, continuous motion exercise a bike can offer is great for arthritis. Unfortunately, traditional upright exercise bikes are usually too uncomfortable or too difficult to get on for most seniors. The recumbent bike solves this problem because they are much easier to get on/off of and they can provide the same continuous motion exercise that the upright bikes offer. Recumbent bikes can really provide a great cardiovascular workout too. Just because they are reclined doesn’t mean they have to be easy! The nice bikes can offer enough resistance to give anybody a good workout. Working out with higher resistances will also improve your leg strength- stronger legs make getting out of chairs easier, going up and down stairs easier, not to mention improved stability during ambulation. These bikes will offer some additional features you may enjoy as well. These include preprogrammed workouts, display screens, fans, speakers, USB charging, and many others depending on the model. It’s important to consider what (if any) features you are looking for in your exercise bike. You can save a lot of money if you are not looking for any fancy bells and whistles. If you are simply looking for a bike to keep those legs moving and you aren’t worried about workouts programs or LCD displays, a pedaler might work just as well. If you aren’t familiar with pedalers, you aren’t alone. I had never seen one before I started working as a therapist. A pedaler, also known as a pedal exerciser, is basically a portable set of bike pedals. I’m not sure that makes any sense. It’s kinda like a stationary bike without the seat. Does that make sense? These machines are very small and lightweight. You can put the pedaler in front of a senior who is sitting in a chair, wheelchair, or even the edge of their bed. The biggest benefit of a pedaler is that the senior doesn’t have to get on a separate piece of exercise equipment. The pedaler can simply be placed in front of them while they are sitting in their favorite chair and they can pedal (as they would on a traditional exercise bike) as they watch tv. Pedalers are a great tool for providing range of motion exercise. They don’t offer as much resistance or as many features as a recumbent bike. On the other hand, they are less expensive. These machines can still offer a cardiovascular workout depending on the fitness level of the senior. These products work well for folks that have significant mobility problems. Seniors who can’t stand or walk for example. You can put one of these in front of their wheelchair and they will still be able to exercise their legs and get the cardiovascular benefits from exercise. You can also put pedalers on a table and work your arms. Pedalers are also great for seniors who have COPD or get short of breath really easily. This gentle, low resistance exercise can help build up endurance. Maybe even to the point where walking and other forms of exercise become possible. There are also some combination pedal exercisers out there that have pedals for legs and arms at the same time. These can be nice if you are looking to get more of a total body workout at the same time. Instead of say, doing legs for 10 minutes and then placing the pedaler on a table and doing arms for 10 min, you could easily do arms and legs at the same time. I actually just ordered one of these for a patient of mine (I hope he actually uses it). Because, unfortunately, the sad truth is that we all have the best of intentions when we purchase exercise equipment. We are all motivated at the beginning. We are going to use our new equipment and get in better shape! And then the newness of it all wears off… The reality of having to get on and use our new bike on a daily basis (or at least regular basis) becomes a chore. Then, next thing you know, that exercise bike is collecting dust in the corner. If you purchase an exercise bike, please find a way to use it regularly. Using a recumbent bike or pedaler is great exercise for seniors (as well as all of us) so I encourage you to set up a schedule or place it in front of a tv so that it becomes easier to use. Ok, my rant is over. Let’s take a look at the best exercise bikes for seniors. The Schwinn 230 finds it’s way on everyone’s “best recumbent bike” list because, well, it’s one of the best. It’s also one of the most affordable recumbent bikes on the market. The Schwinn 230’s combination of quality and affordability makes it really tough to beat. For a senior looking for a comfortable, easy to use recumbent bike, this is a great choice. It’s manufacturer, Schwinn, is a powerhouse in the biking world. Schwinn has been producing world class road bikes for over 100 years. They have been in the fitness game since the 1960’s. They’ve effectively used their biking experience to create awesome exercise bikes that are always highly rated among users. The Schwinn 230 is no exception. This exercise bike offers 20 different levels of resistance and 22 different workout programs. With this much variety and resistance, there’s no doubt you will be able to get a great cardiovascular and strengthening workout. The 20 levels of resistance will give you a lot of control over how easy or hard it is to pedal. Instead of jumping up drastically each time you increase resistance, it will gradually increase giving you a lot more control. This is a great bike for seniors because of how comfortable it is to sit on. It has a large, vented back rest with lumbar support that will reduce back pain during use. It also has a large, contoured seat (also vented) for added comfort. The Schwinn 230 also has a convenient step through design. This makes it easier to get on and off the seat. If you’re using a walker, you can easily approach the bike, turn, and sit without any parts of the frame impeding access. As you can see, the Schwinn 230 has a lot to offer. Regardless of your fitness level, this recumbent bike will be able to adapt to meet your needs. It has enough resistance and workout programs to really keep you working, but it’s also gentle and comfortable enough for those seniors that just need to keep those joints moving. This recumbent bike from Marcy is a good option if you aren’t looking for all the programs and features that the Schwinn offers. This is a nice, simple bike that is good for a senior that just wants to get on and start pedaling. It doesn’t have as many bells and whistles as the Schwinn, but it’s still good at what it does. The Marcy recumbent bike has a much simpler display screen. The console is smaller and there are no preprogrammed workouts. The monitor does track speed, time, distance, and calories burned. The numbers are large, which makes it easier to read for senior users. This bike also has a step through design, which makes getting off and on a little easier. This comes in handy if mobility is an issue. This bike offers 8 different resistance levels which are changed by turning a resistance dial. The Marcy bike has a thick, foam padded seat and back rest. It also has padded arm rests to keep you comfortable and secure as you pedal. Speaking of pedals, the pedals are weighted and have adjustable straps. This makes the pedals feel more secure and allows for a perfect fit regardless of your shoe size. This bike is lightweight, which makes it easy to move from room to room if necessary. Assembly is also easy, the instructions make sense and everything is well labeled. It comes with a manufacturer’s 2-year limited warranty. Not great, but not bad for a bike at this price. Quiet, smooth ride Delivery issues? Overall, this a nice recumbent bike if you are not looking for anything too fancy. It offers a smooth, quiet ride and it doesn’t take up too much space. This bike would be perfect for you if you are looking for an easy to use, affordable bike. If you are looking for more resistance or more features, I would recommend the Schwinn 230. The Marcy recumbent bike is highly rated amongst users. The biggest complaints I found had to do with broken parts upon delivery. All in all though, a very popular and well-rated exercise bike. 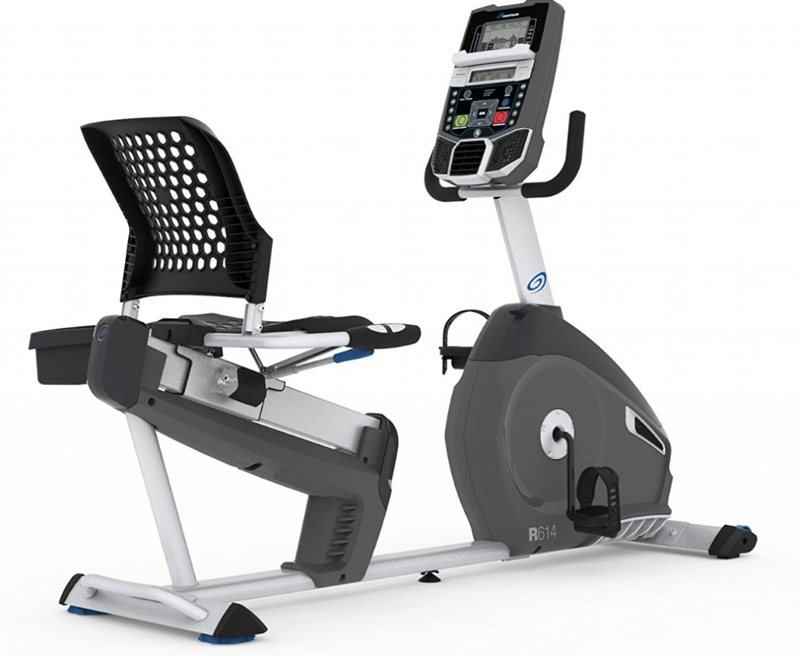 The Exerpeutic 900XL is very comparable to the Marcy bike right above. There are a few differences I want to point out that might help your decision making though. Both of these bikes are in the same price range- the Marcy is on sale currently making it a little cheaper, but they are in the same ballpark. This recumbent bike also has 8 levels of resistance that is controlled by turning a resistance dial. This bike isn’t going to offer as much resistance or as much control over resistance as the Schwinn 230 does. This bike’s resistance is going to be very close to the resistance the Marcy bike offers. This makes this bike a great option if you don’t need much resistance for your workout. And just because a recumbent bike doesn’t offer a lot of resistance, doesn’t mean it still can’t serve a good purpose. I mentioned above that gentle range of motion is great for arthritic and achy joints. You don’t need a lot of resistance to achieve this. The Exerpeutic 900XL would work perfectly for this type of exercise. This bike’s display screen is very similar to the Marcy’s. This bike also has a 300 lb weight capacity and it’s size is comparable to the bike above. So what’s different about the Exerpeutic 900XL? The biggest difference is that this bike offers a grip heart rate monitor. This is a great feature for seniors that have had heart problems because you can keep a close eye on heart rate as they exercise. The heart rate is displayed on the monitor along with time, distance, speed, and calories. This bike’s warranty is a little better, Exerpeutic offers a 3-yr warranty. The Exerpeutic 900XL has a large, cushioned back rest and seat. Most users report it feels fine during exercise, others complain that it isn’t very comfortable. Like all exercise bikes, opinions vary on seats. If you don’t have any major back problems this seat should be fine for you. Overall this a very nice, affordable recumbent bike. Another great bike if you aren’t looking for any fancy features. With an average user rating of 4.2/5 and over 2,300 reviews, it’s one of the more popular bikes on Amazon. The Stamina Elite recumbent bike can offer something none of the other bikes thus far can: an upper body workout. This is a recumbent bike with a set of hand pedals. This gives you the ability to work both arms and legs at the same time. Pretty nice if you are looking for more of a total body workout. Hand pedals aside, let’s take a look at what the Stamina Elite can offer. This bike also offers 8 levels of magnetic resistance, adjusted via a control dial. Don’t ask me what is so special about the number 8, but it seems that is the chosen number of resistance levels on a lot of these bikes. The good thing about a magnetic resistance system is that it is super quiet- if you or a senior in your family is exercising early in the morning or late at night, they won’t have to worry about waking any sleeping family members up. The display screen is pretty comparable to the Exerpeutic and Marcy bikes discussed earlier. No fancy displays or designs, just a simple LCD screen that will monitor calories burned, time, distance, and heart rate. Yes, this bike also has a hand grip heart rate monitor. The Stamina Elite has a nice, padded back rest and comfortable seat. This should make it more comfortable to use for either upper body or lower body exercise. The seat is adjustable and is also declined a little for improved comfort. It’s constructed with a steel frame, however the max weight capacity is only 250 lb. I like to use weight capacity as a direct measure of a machines durability, the higher the better. Bikes in this price range should be at least 300 lb, so I’m a little disappointed with their weight limit. Stamina does offer a pretty decent warranty on this bike: 5-year frame, 1-year parts. Overall this is a pretty nice recumbent bike for seniors. The only real reason to purchase this over another option would be for the upper body workout. That said, this bike is over priced. This bike is currently priced higher than the Schwinn, which is pretty hard to believe. If you are looking for upper body exercise as well, you could easily purchase a pedaler separately and put it on a table- you would save yourself a lot of money. Nautilus is another huge name in the fitness world. They have been producing high quality equipment since the ’70s and they are definitely one of the reasons home fitness is where it is today. Their recumbent bike, the R614 is a great example of an affordable piece of equipment that is designed effectively with the user in mind. The R614 is very comparable to the Schwinn 230. That is, this is a more advanced bike with more options and a few more features than the last few bikes discussed. This bike is appropriate for you if you are looking for a more durable, comfortable bike with preprogrammed workouts. This bike (like the Schwinn) more closely resembles a recumbent bike you would see in a commercial gym. This bike offers 20 levels of resistance and 22 different workout programs. You can always just hop on and ride in manual mode too. This bike also offers a 3 speed fan, speakers, and a USB charging port. I like to mention this, but I know most of the seniors I work with wouldn’t be to concerned with these features. On to the important stuff, how comfortable is it to ride? Well, the R614 offers contoured back rest and seat, which makes it feel more comfortable and more supportive. The back is vented to help keep you a little cooler while you ride. Some users complain the seat isn’t that comfortable, others say it’s fine. Seat comfort is always one of the biggest complaints riders have. Comparing notes, the Schwinn appears a little more comfortable to me. This bike also has an adjustable seat and step through frame, so getting on and off of it shouldn’t be a problem for seniors. Nautilus backs up it’s bike with an impressive warranty: 10-year frame, 2-year mechanical, 1-year electrical, 90-day labor. Overall, this is another really nice recumbent bike for seniors. It has a lot to offer and it’s priced pretty well. It’s a tough call between this bike and the Schwinn 230. I still like the Schwinn a little better because it’s a little more comfortable and it’s a little cheaper. But the Nautilus R614 is the only bike on this list that can give the Schwinn a run for it’s money. I love the Sunny Health & Fitness brand. They have become so great at producing affordable exercise equipment for the home that actually works. I’m not sure how they do it, but they always find their way on my “best of” lists. For the price, it’s really tough to beat their products. This magnetic recumbent bike they offer is another great example of their handy work. The first thing I want to point out is that this bike has a 350 lb weight capacity! That’s more than the Schwinn and the Nautilus! Now this bike isn’t as nice as either of them, but that tells you how well built this machine is. That’s even more impressive considering this bike is significantly cheaper than both of those bikes. This bike offers 8 levels of magnetic resistance, also adjusted with a turn dial. This should offer plenty of resistance for seniors to get a good workout, but it won’t have so many options as to make controlling the bike difficult. Sometimes having too many options or selections to make can be a bad thing. The back rest and seat on this bike are fairly small, but the seat is easy to adjust with a conveniently placed seat lever. You can easily slide the seat forward or backward while sitting on it to ensure the most comfortable position during use. The Sunny Health & Fitness recumbent bike also includes a hand grip heart rate monitor. This is another great quality for a bike this cheap. I told you this company was awesome. This is a great recumbent bike for the price. I know I keep mentioning the price, but it really is that good. This bike is almost as affordable as some of the pedalers we are about to discuss. If you are looking for an affordable, durable, easy to use recumbent bike, look no further. Check out my comprehensive guide on the best recumbent bikes available to see more great options. So now we step into the “pedaler” category. Remember, these machines are smaller because they do not have a seat. You place this set of pedals in front of a chair, couch, or bed and the senior can pedal on them as they would on a bike. They don’t tend to offer as many features or resistance levels, but they are very convenient for individuals that have mobility problems. That said, this pedal exerciser is actually designed to be used under a desk. I think this machine would work great for seniors because it is more stable and can offer a smoother pedaling motion than most traditional pedalers. Many pedalers have a screw you tighten to increase resistance, this exerciser actually has a nice dial comparable to the recumbent bikes above with 8 different resistance levels. This is fairly unique with the pedalers. This resistance system makes for a very smooth, quiet operation. Consider that this device was designed to be used in a busy office where people are working. This means being quiet is a necessity. Seniors will appreciate how smooth and quiet the pedal motion is- you can easily watch tv or exercise while family members are resting without worrying. Most pedal exercisers don’t have a display screen, but the DeskCycle has a monitor that displays time, distance, speed, and calories burned. Another problem many pedalers have is that they are too lightweight and they move or slide on the floor as you start pedaling. You have to brace up against something to keep it in place. The DeskCycle has solved this problem by adding a wider base. It stays in place as you pedal comfortably. This is the nicest pedaler I have come across and it’s obvious users feel the same way: it’s rocking a 4.7/5 average rating on Amazon with over 1,700 reviews! That’s a lot of happy customers. If you are looking for the nicest pedal exerciser on the market, you should take a closer look at the DeskCycle. This pedal exerciser by Vive isn’t quite as sleek and stylish looking as the DeskCycle, but offers a lot of the same features for a significantly lower price. This pedaler is designed to fit under a desk (or on top of a desk) so it could be used in the office during work, but it would work great for a senior exercising at home as well. This model is a little bulkier looking than the DeskCycle, but it’s only about 12″ high. This pedaler also offers adjustable resistance by using a turn dial- this is a nice feature to have because pushing again zero resistance can actually make it feel a little awkward. Adding a little resistance gives it a little more natural of a feel for the user. This exerciser has a fairly wide base to improve stability during use, however the DeskCycle’s base is wider. A lot of pedalers tend to wobble or slide during use and having a wider base will make this less likely. That said, users didn’t have many complaints about this machine moving. Vive added a display screen to their pedaler, so you will be able to monitor time, distance, speed, calories, and RPM. Nothing too fancy about the screen, pretty comparable to any other display you would see on a pedaler. The fact that it has a display to begin with is nice, some don’t. The pedals have an adjustable strap to help fit shoes of any size comfortably. This exerciser can easily be placed on a desk or table for working the arms. This is a nice feature- sometimes we neglect our arms and only concentrate on working our legs, but it’s just as important to keep those arms strong and mobile as we age as it is our legs. Vive offers a 1-year unconditional warranty on their pedaler. This is really nice and you don’t always see a warranty on such an affordable piece of equipment. Anytime a manufacturer offers a warranty it’s a good sign. The pedal exerciser by Vive is a great, all around pedaler for seniors. It’s easy to use, stable, and more affordable than the DeskCycle. A good option for working arms or legs at home. I raved about the Sunny Health & Fitness brand earlier when discussing their recumbent bike, I’d like to do so again real quick…I love them. They always find a way to produce higher quality products than you would expect for their price range. This mini bike they produce is another example of their craftsmanship. This product is very comparable to the 2 pedal exercisers discussed above. This machine also has 8 levels of adjustable resistance, adjustable pedal straps, and a LCD display screen. There are a few differences I would like to point out. First of all, this pedaler is pretty heavy, weighing in at 21 pounds. This is a good thing, trust me. Yes you may have to work a little harder to transport it (but it does come with a convenient handle), but this also means it is going to stay put when you use it. Machines that are too light aren’t going to be able to withstand your force while you are exercising. It’s really annoying when your pedaler keeps scooting across the floor. I mentioned the adjustable pedal straps, that’s nice. But these pedals actually have little finger grooves in them making them more comfortable while exercising your arms. This is a nice little touch that does make a difference. Remember, its the small things that make all the difference in the world. Lastly, this machine’s display screen is nice and big, very easy to read. This is a great feature for our seniors because (unfortunately) our vision tends to deteriorate as we age. Having bigger numbers to read makes it easier to keep track of your times and distances. This mini-bike from Sunny Health & Fitness is kind of a combination between the DeskCycle and Vive’s pedal exerciser: it’s big like Vive’s, but it’s more stylish like DeskCycle. This is a very highly rated product online, it’s rocking a solid 4.4/5 rating on Amazon. Being familiar with this company, I’m a little surprised this product isn’t a little cheaper. It’s definitely priced appropriately based on the competition, but I’d like to see it under $100. Overall though, great product. The MagneTrainer-ER is another one of the most highly-rated pedal exercisers on the market. MagneTrainer advertises this device as a “commercial grade” piece of fitness equipment. “Commercial grade” in this instance refers to physical therapy clinics and rehab settings. I used to work in an outpatient physical therapy clinic and we didn’t use these, we had a truly commercial grade NuStep and a UBE (upper body ergometer). I can’t vouch for this product’s ability to stand up to multiple users on a day in day out scenario like a rehab clinic. But I do think it would work wonderfully as an exercise bike for a senior working out at home. This exercise bike is built durable. It has a steel frame and nice wide base legs for added stability during use. It should definitely be able to hold up for home use without a problem. MagneTrainer also boasts that it offers more resistance than the competition. It’s resistance dial isn’t limited to 8 levels, it has a progressive resistance system that continues to get harder and harder the more you turn it. It’s resistance is magnetic, so it will be smooth and quiet. It does have a display screen, but it’s nothing to write home about. Just a simple screen that shows the basics: speed, distance, time, calories. I do like that MagneTrainer offers a full 1-year warranty and 30-day money back guarantee. I like it when a company is confident in their products ability to perform. This is one of the more expensive pedal exercisers on this list, but it’s also one of the most popular. This pedaler is built like a tank and really should stand up to anything you can throw at it. This is a great option for seniors, especially seniors that are looking for some resistance to pedal against. Its sturdy and reliable with a good warranty from the manufacturer. This pedaler by Platinum Fitness is a good example of your average pedaler. It’s very lightweight, low-tech, and affordable. This device is not in the same league as the 4 devices discussed above, but it still has it’s place. These types of pedal exercisers are good for seniors who are not looking for resistance in their machine. These are good for offering gentle range of motion exercise. The first thing you will notice is that this frame is much smaller and lighter. There’s no magnetic resistance system on this guy. You simply tighten up a screw that increases resistance. Platinum Fitness reports that their technology keeps the pedaler from over-heating during use, which is nice. This pedaler does come with a display screen to keep track of your time, etc. This is nice, many in this price range don’t. This pedal exerciser is also foldable. This, along with it’s light weight, makes it very easy to store when not in use. This would be a great option if space is an issue. This product has foot straps to help keep your feet in place, but I will tell you right now these machines don’t work well with folks that have large feet. This will work a lot better for smaller feet. This device will not be sturdy enough to hold larger feet in place while you pedal. The best feature of this pedaler is the anchor strap that comes with it. This is a brilliant idea. I like that Platinum Fitness doesn’t try to pretend that this device isn’t going to move during use, because it most certainly is (especially if pedaling with your feet). The anchor strap will attach the pedaler to the chair you are sitting on and keep it from sliding away. Great idea. This product also comes in different colors. Nice feature I guess, keeps it fun. Overall, if you are looking for light range of motion type exercise, this pedaler can work. Please don’t purchase this item expecting a durable pedal exerciser, you will be disappointed! If you know what you are getting, you will be happy though, this is one of the highest ranking pedalers in this category. Last but not least, well, actually in this case I guess it is least, we have the Vaunn Medical Pedal Exerciser. This is a no-thrills, simple pedaler at it’s finest. I don’t mean to pick on Vaunn Medical (I mean they did make the list! ), but this product is last on the list because it offers the least. There is some quality in it’s simplicity though. Less moving parts means less stuff that can get broken. This pedaler is as simple as it can be- just 2 pedals on a stand, that’s it. And Vaunn owns it. They take pride in the fact that their pedaler is constructed of a single piece of chrome plated steel. This pedal exerciser comes already assembled. This is really nice because assembly can be a pain. When seniors receive this device, it’s ready to go straight out of the box. Vaunn also guarantees that it will never rust, for life. There is no display screen on this exerciser. If you aren’t worried about keeping track of distance or calories, this won’t be an issue. You can always use a clock or watch to keep track of time. Or better yet, you could pedal while watching a tv show and rest when the commercials come on- great way to increase your activity during the day. If you are looking for a simple, no thrills pedaler, here it is. These work well for gentle range of motion activity, not so well once you start adding the resistance. Exercise is as important for seniors as it is for everyone else, sometimes we forget this. As a therapist, I would argue it may be MORE important because it helps maintain joint range of motion, strength, and mobility- all of which equals improved quality of life for our seniors. I hope this article was helpful. If there are any questions or concerns, please don’t hesitate to contact me or leave a comment below.